GREEK BOUZOUKI. HEAVY GAUGE. OCTAVE STRUNG. 12 - 24. LOOP OR BALL-ENDS. 6 STRINGS. 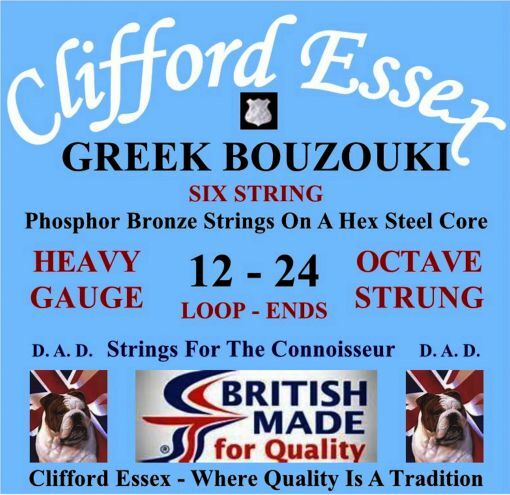 Location: /Strings/Mandolin/Greek Bouzouki/GREEK BOUZOUKI. HEAVY GAUGE. OCTAVE STRUNG. 12 - 24. LOOP OR BALL-ENDS. 6 STRINGS. The 1st and 2nd strings are plain steel with loop or ball-ends. The 3rd string is nickel or phosphor bronze round wound, the octave is plain steel, loop or ball-ends. We offer a choice of phosphor or nickel round wound strings on a hex steel core. Our phosphor bronze wound strings are acclaimed throughout the world for their warm, bright, long lasting tone, they are ideal for the acoustic bouzouki. Our nickel round wound strings are well known for their strong magnetic properties, very bright tone and projection, ideal for the electric bouzouki, on acoustic instruments they produce a rich mellow tone. BE SURE TO ENTER YOUR REQUIREMENTS IN THE PREFERENCE BOX BELOW. PHOSPHOR BRONZE OR NICKEL ROUND WOUND, LOOP OR BALL-ENDS. IF YOU REQUIRE ONE, TWO OR THREE SETS BE SURE TO CHECK 'NO THANKS' IN THE STRINGS PRODUCT OPTIONS BOX AND ENTER THE QUANTITY YOU REQUIRE IN THE BOX TO THE RIGHT BELOW.